Russia's next generation heavy military tracked vehicle platform, better known as the Armata, has every chance of winning one-on-one battle against the best tank Germany has to offer, the Leopard 2A7, according to the National Interest. Although both war machines are hailed as exceptional pieces of military hardware, "Berlin's tanks in a theoretical match-up would face a problem," NI's defense analyst Dave Majumdar noted. 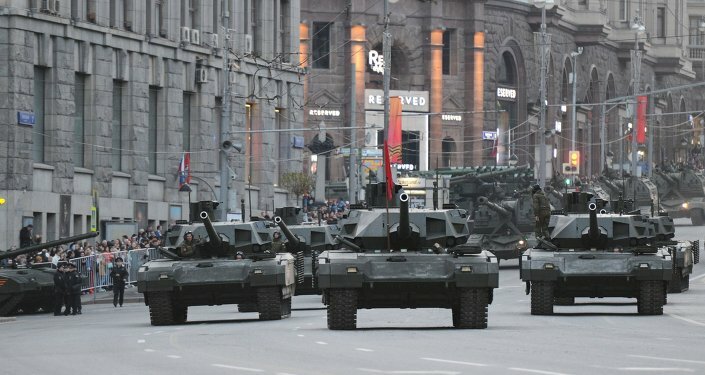 "While the Leopard is probably overall more than a match for the Armata – it doesn't have the right ammunition to defeat the T-14," he explained. According to the expert, the Leopard's key disadvantage stems from the fact that it uses tungsten instead of depleted uranium for tank rounds. The choice of material affects performance. "Because of the limitations of tungsten ammunition, the Bundeswehr has some doubts as to the ability of its penetrator rounds to punch through the armor of the latest Russian tanks. Specifically, there might be instances where German ammunition might not have enough kinetic energy to ensure a kill against the T-80, T-90 and obviously the Armata," Majumdar pointed out. The solution to this problem might seem obvious – replace tungsten with depleted uranium but the Leopard is unlikely to receive rounds made out of depleted uranium since the Germans are largely against the move. Using US-made ammunition could have been an option but it is said to be incompatible with the Leopard's improved L55 tank gun. The Leopard might well be one of the world's best tanks "when it comes to blending firepower, protection and maneuverability," as defense analyst Thomas Newdick put it, but the future seems to belong to the Armata platform at the moment. Keep in mind, that Russia's cutting edge piece of military equipment will not remain static. For instance, its designers say, that the Aramata could well become the first unmanned tank in the world.